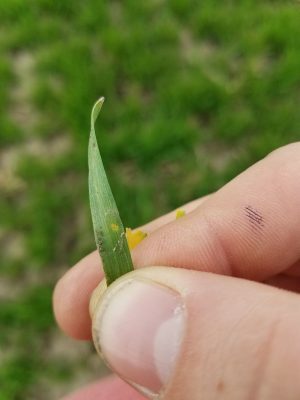 Two Small Stripe rust pustules on a winter wheat leaf. The Wisconsin Field Crops Pathology crew has continued to scout wheat in various locations around the state of Wisconsin. Wheat in the southern part of the state is near or at jointing. Wheat in the central zone is also near jointing. We have now confirmed stripe rust in a production winter wheat field near Arlington Wisconsin (April 20, 2017). The variety is Pro Seed 420 which is known to be susceptible to stripe rust. We suspect that stripe rust has overwintered in this location, in addition to the Sharon Wisconsin location that we reported several weeks ago. We have also received a report of stripe rust from Kenosha Co. In all cases where stripe rust has been found, it is at low incidence and severity. However, the weather is becoming conducive for the stripe rust pathogen, so these areas of active rust should be monitored closely so that an informed management decision can be made. Many are considering a tank-mix of fungicide with their herbicide application. However, be aware that this application will only be effective for 2-3 weeks at most. We have found that when it comes to application of fungicide for stripe rust control, applications that coincide with the introduction of stripe rust that also protect the flag leaf, are most beneficial on winter wheat in Wisconsin. This has been investigated and reported by our laboratory and presented at the Wisconsin Agribusiness Classics. You can find that report here. At this point in the season, growers and consultants should continue to scout carefully for stripe rust. Also, consider the susceptibility rating of your wheat varieties. In fields where stripe rust is active and you have a susceptible variety, careful monitoring will be required and earlier spraying necessary. In fields with no confirmed rust and resistant varieties, continued monitoring of the situation will be necessary. Fungicide application should be saved until as close to flag leaf emergence as you feel comfortable waiting. You can find efficacy ratings of various fungicide products against stripe rust here. Get out and scout, scout scout! !